Johan Helmich Roman is the first Swedish-born professional composer in history. He played a key role in the development of musical life in Sweden. He was a child prodigy at the violin, playing at the age of seven in the court orchestra in which his father was a violinist. From 1715 to 1721 he stayed in London, where he was sent by King Charles XII to perfect his skills. In London he played in the orchestra of the Royal Academy of Music under George Frederic Handel as one of the second violinists. He also became acquainted with famous masters of that time, including Giovanni Bononcini, Francesco Geminiani and Francesco Maria Veracini. When he returned to Stockholm he was appointed deputy Master of the Swedish Royal Chapel and given the task of building up the city’s musical life. The situation in the Swedish capital was very different from that in London: there were neither public concerts nor opera performances. During the 1720s considerable changes took place. Some of Lully's operas were performed by a French theatre company, and Roman composed some works of his own, including a cantata in honour of King Frederick I. 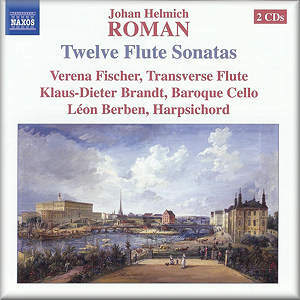 In 1726 Roman announced that he intended to publish his 12 flute sonatas. In order to increase sales advertisements also appeared in newspapers in other European countries. In Germany Georg Philipp Telemann acted as Roman’s agent. The next year the 12 sonatas were indeed published, with a dedication to Queen Ulrike Eleonora. It is remarkable that Roman wrote his sonatas for the transverse flute, an instrument he himself did not play. Although there are some violinistic traits in some of these works they are quite idiomatic for the transverse flute. It is clear from the title page that Roman had written the sonatas for amateurs. Among them the transverse flute was quickly growing in popularity, both in Sweden and abroad. And the German flautist and theorist Johann Joachim Quantz had stated that in the 1720s there was very little music available which was specifically written for the transverse flute. So there definitely was a market for flute sonatas. It is not known how well the collection sold, but copies have been found in several libraries in Sweden and abroad. Apparently they were played as late as the early 19th century. Like so much music of that time Roman's sonatas reflected the 'goûts réunis': there are Italian and French elements, and a number of movements are in fact dances, although Roman uses only the Italian character descriptions like allegro, adagio or larghetto. The influence of Handel is particularly noticeable. The structure of these sonatas reflects their individual character. Most are in four or five movements, but there are also some sonatas in six or seven movements. Some movements are divided into subsections with different character indications. These include the second movement of the Sonata No 2: larghetto, andante, adagio. Unusual are indications like 'piva' and 'villanella' which appear in the Sonata No 10. The first is what the French would call a 'musette', the latter reflects the influence of folk music which can be found at several points in these sonatas. When I listened to these sonatas it struck me that many movements are quite dramatic, for example through the frequent use of short general pauses. In this performance the interpreters have included short cadenzas at various points. I don't know if Roman gave any indication as to whether these should be added, but they seem to me in line with the overall character of these works. The artists have captured their spirit very well. Their performances are bold and daring. In some movements the realisation of the basso continuo has an almost concertante character which definitely suits them. The contrasts in tempo between the movements come out well. Fast movements are generally played very fast and slow movements really slow. Only occasionally do I find the tempi maladroit. The andante of the Sonata No 1 in this case sounds more like an adagio. Moreover, I could easily imagine a more differentiated treatment of dynamics. There were moments when I was longing for greater dynamic inflection from these artists. That said, these remarks take little away from my appreciation of this recording. This is first-rate music and with Verena Fischer, Klaus-Dieter Brandt and Léon Berben it has found close to its ideal interpreters.